Elegant, and tasteful, this basket of nature’s best arrives fresh from the River Deltas of Northern California's Sacramento Valley. 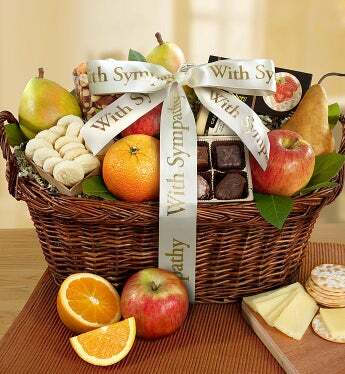 They’ll appreciate the sturdy, real wicker gift basket that’s filled with Roasted and Salted Mixed Nuts, Sierra Nevada® Jack Cheese, Buerre Bosc and Imperial Comice Pears, Fuji Apples, a California Navel Orange, Assorted Chocolates, Shortbread Cookies and more. • Arrives orchard-fresh, ripe and ready to eat! Elegant, and tasteful, this basket of nature's best arrives fresh from the River Deltas of Northern California's Sacramento Valley. They'll appreciate the sturdy, real wicker gift basket that's filled with Roasted and Salted Mixed Nuts, Sierra Nevada® Jack Cheese, Buerre Bosc and Imperial Comice Pears and more.